Yesterday, during a somewhat innocent meditation class, I received a prognosis for an untreatable condition called Life. I have only one year to live. Perhaps less. The prognosis did not surprise me too much. I had been preparing for the class (which is based on the book, A Year to Live, by Stephen Levine) and for the prognosis for a few weeks now. What struck me, though, was the realization of how fleeting my life really is. Eight years ago, I signed up for a trip which fascinated me to no end. It was a backpacking-and-mountaineering trip into the depths of the Olympic Rainforest to climb Mount Olympus. Who among us did not long, at least for once in their life, to visit the abode of the gods? I never wondered at the Greeks for believing that their gods lived on top of a seemingly unreachable, snowy mountain. Had I been a god, I would have wanted to live on a pristine snowy peak, with the view of a thousand mountains, valleys and plains around me. Best of all, reaching Mount Olympus required passing through all these mountains and Valleys. I loved the idea of backpacking 15 miles in order to reach the mountain. The remoteness, the scenery, the adventure, all appealed to me. A few days before I was due to leave, my son fell off a slide and broke his arm, a moving fracture that looked terrifying and required a reduction at the hospital. For a moment, I was not sure if I would be able to leave for my trip, but then it was the day of my flight, and I was going. My son was alright with the cast, not really requiring any extraordinary amount of care other than, perhaps, with showering. His dad was to take care of him, and I gave myself permission to go. I still remember getting to my hotel (it was a Holiday Inn Express not too far from the Seattle Needle). I remember having breakfast the next morning, inquiring about leaving my huge, now mostly empty white bag with clean clothes and some toiletries with the front desk till I returned, dragging my blue pack, so full of stuff that my ice axe and boots and crampons were hanging off the back like I was some medieval peddler. I remember seeing Pat and Alan, the two guides, and thinking they might be a father and son. I remember the equipment check on the floor in the Mountain Madness office, and what I thought when I first saw Mel, Mel who turned out to be my best friend on the trip. And then we were away and driving and crossing the sound and driving some more and in the parking lot, checking equipment again and splitting up the food and group equipment, and I remember shouldering the heaviest pack I had ever carried, quite possibly 45 or 50 pounds to my barely 115. And then we were off, hiking fast through some of the most beautiful scenery I had ever seen, swallowing up the miles. 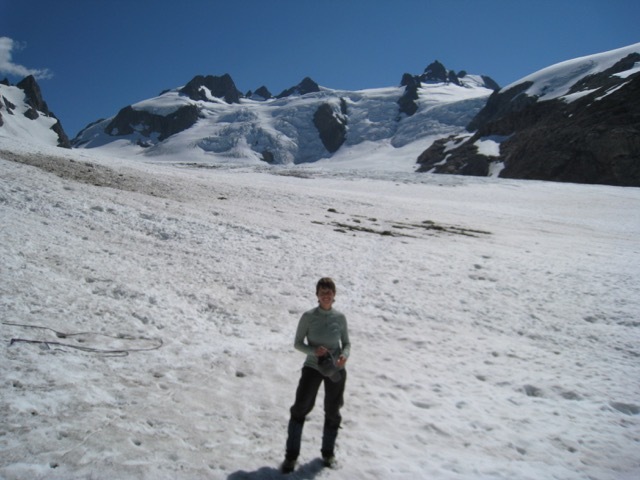 Seemingly, I remember everything about this trip: the rainforest teeming with green life, the Hoh River flowing merrily and twinkling next to the trail for most of the way, how cold it was in the early morning when we began our climb, and how steep Snow Dome was. I remember getting to know the other seven men in the group (I was the only woman), crossing the avalanche zone, the beauty of the Blue Glacier. And of course, the top of Mount Olympus, and rock climbing up and down-climbing and rappelling down. But most of all, I remember our last night on the trail. We slept on an island in the middle of the Hoh, except, I couldn’t sleep. I lay on the sand in my sleeping bag, and the echoes of the trip pounded in my blood and the river flowed through my veins, both calling to me to stay forever. Stay, every leaf whispered, every grain of sand. There was only the river and the forest and the wonderful people on the climb. Home seemed far away and unreal. Only the Here was alive and true, and it seemed impossible to me that the night, stretching starry and bright around me, would ever end. On Snow Dome with the tip Mount Olympus peeking in the background. 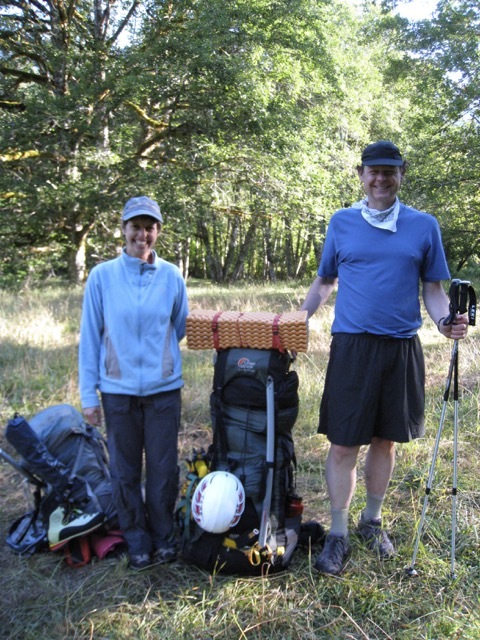 Mel and I on breaking our first camp, comparing the various sizes of our packs. His weighed more than I did. I climbed Mount Olympus in August of 2008. Back in the car, we drove with the windows slightly open — everyone stunk after five days with no showers. We had lunch together (I remember the waitress asking Alan for an ID — he was twenty-two at the time), and then we were dropped off at our hotels. I showered and soaped several times before I was clean, wandered around Seattle for a time, and had dinner by myself at a pizza parlor near the Needle. The next day I flew home. The adventure was over, then it was gone, and then, before I knew it, it lay buried under the dust of many days, weeks, months and years, a shiny memory with mothballs. This year, my last to live, I would like to live as I have lived on Mount Olympus, enjoying every breath, every smell, the sight of every blade of grass, feeling raw and real. Because this year, the last year of my life, is going to go by the same way as my trip had. Here today, with 364 days to go, it seems like it would go on forever, but as I blink, only 60 days will remain, and then 3 and 2 and 1, and soon a marker will be the only thing reminding you where you put the last physical remnant that I’d been here. And then, while you blink and take your breaths, it will be 2025, and you would wonder, could it really have been seven years? Isn’t life surreal? Isn’t life just so, so real? The adventure, so soon to end, begins, and it was only appropriate, you know, that it would begin with a blog post.